The mystery behind radio signals that have baffled scientists at Australia’s most famous radio telescope for 17 years has finally been solved. The signals’ source? A microwave oven in the kitchen at the Parkes observatory used by staff members to heat up their lunch. Simon Johnston, head of astrophysics at the CSIRO, the national science agency, said astronomers first detected the signals, called perytons, in 1998. The signals “were reasonably local, say within 5km of the telescope”. Originally researchers assumed the signals – which appeared only once or twice a year – were coming from the atmosphere, possibly linked to lightning strikes. Then on 1 January this year they installed a new receiver which monitored interference, and detected strong signals at 2.4 GHz, the signature of a microwave oven. Immediate testing of the facility microwave oven did not show up with perytons. Until, that is, they opened the oven door before it had finished heating. “If you set it to heat and pull it open to have a look, it generates interference,” Johnston said. 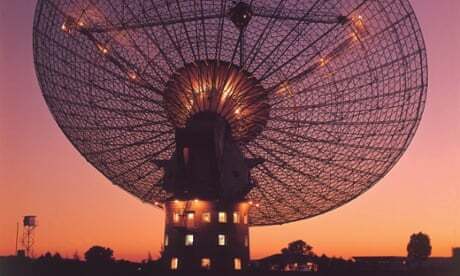 Astronomers generally operate the telescope remotely and do not reside at Parkes. There were, however, a number of operational staff members who maintained the facility and used the microwave oven to heat their coffee or lunch. Johnston said the “suspicious perytons” were only detected during the daytime and as they now knew, not during the evening when all the staff had finished their shift. The signals were rare because the interference only occurred when the telescope was pointed in the direction of the microwave oven. And “when you only find a few it’s hard to pin them down”, Johnston said. The findings have been reported in a scientific paper. Human interference is a common frustration for astronomers. At the Siding Spring optical observatory in northwest New South Wales, astronomers recently voiced concerns over a proposal for a new coal seam gas project, fearing it could lead to increased light pollution in the area. 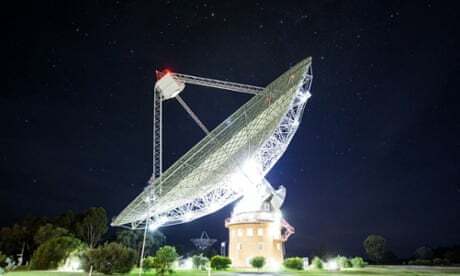 Johnston said there were many things that caused interference to the Parkes radio telescope – famous for its role in the moon landing, as portrayed in the movie The Dish – including FM radio, digital televisions, mobile phones and wireless internet. “If we tried to have an observer in Sydney the radio noise would be so terrible you’d never see our astronomy signal,” he said. Johnston added that in 1967 astronomers at the Haute-Provence observatory discovered what they thought were potassium flare stars. They eventually concluded the spectroscopic observations were probably caused by matches struck in the vicinity. The telescope was established in Parkes 50 years ago in what was “the middle of nowhere”, Johnston said, far away from any radio noise. But in recent years digital interference from the town was getting worse and worse. However a new telescope in Western Australia called Australian Square Kilometre Array Pathfinder (ASKAP) was being built in what Johnston called “the quietest site on earth to do astronomy”. The telescope will be completed in 2016.